There's a beautiful island called Lanziland, a breathtaking island with beautiful scenery and beautiful people. The people of Lanziland are usually described as happy people. The island is located near the Indian Ocean and is off the coast of East Africa. The island was governed by King Kambua who was highly regarded and respected by his people. It was announced on various TV stations that the King's only son recently proposed to his girlfriend. This became the main news on various media channels and Lanziland people could not wait for the wedding day to be announced as they had a feeling that the King may grant public holidays for the whole island. The royal family began the wedding preparation and the wedding was expected to last for three days as part of the culture of Lanzians. When the wedding dates were announced on television and various media platforms, the people celebrated as though it was the member of their families getting married. As predicted by the people, the King declared three days of public holidays to celebrate the wedding ceremony. The King invited the nobles of the island and respected celebrities for this wedding. Several guesses were made by news reporters about the guests lists; news reporters said it was a great honour for anyone to be invited for the royal wedding. Many journalists strove to ensure their organisation got selected to be part of the official ceremony media in order to get first hand scoops of the wedding. Who wouldn't want to be at such a wedding? On the first day of the wedding, something took the King by surprise. Despite it being a honour to have been invited to the royal wedding, the expected guests did not turn up for the first day of the wedding. The King was concerned about this and sent his officials to contact the guests to establish why they were not at the wedding. The officials reported to the king that the expected guests were verbally abusive towards them when they made contact with them. The King extended his gracious arm to them and asked his officials to contact his guests again to find out exactly what had happened and to remind them that they are welcome to attend the second and third day of the wedding. How nice of the king to have sent out the invitation again. Despite this, the people ignored the officials. Since the guests that were invited refused to come for the wedding, the King sent out his officials to the streets to invite all the people that they could find, whether they were known to be good or bad and whether they were famous or not. Surprisingly, the random people turned up for the wedding and they were received well by the royals. Members of the royal palace including the King welcomed them and they explained the order of the day to them, they even clothed the ones that were not suitable dressed for the occasion. The celebration continued and the media described the wedding as phenomenal. 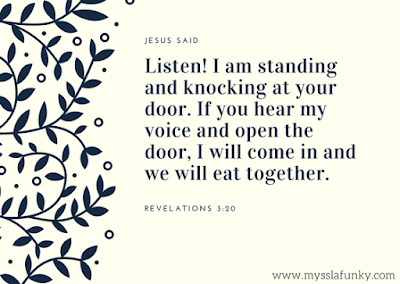 This story can be likened to God's invitation to you. On a daily basis, many are being invited to be part of God's Kingdom (heaven) but only a very few are responding to this special invitation. If Jesus Christ asks you, why should I let you into My heaven and give you eternal life despite your refusal of my invitation. 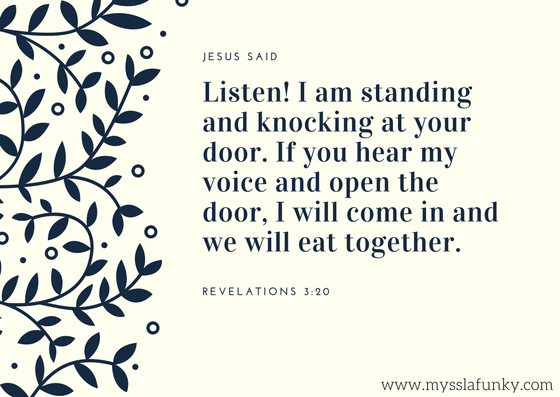 What would you say to Jesus? God wants you to think of your life after this earth as only those that have accepted Jesus Christ as their saviour and those that follow His teachings will be with Him in Heaven and live forevermore. Are you going to be part of God's Kingdom or reject His kingdom? To reject the invitation of God is to reject God’s only provision for eternal life and it is to choose death and hell. Are you taking a conscious effort to invite those around you to be part of God's kingdom? Are you praying for those around you to be part of God's Kingdom? Have a great week ahead. See you next week Monday for another post.